I’m so sorry for the lack of updates this summer! Working full time for the first time in your life is quite the energy drain and I just kind of, well, veg when I’m not working. Anyway, as a token of apology, I’m going to post some video stuff from our adventure with the Fanatics from game 4 of the WCF. Enjoy, you lovely blog-reading people, you. I was originally going to compile a list of what I thought were the 10 best and 10 worst things of the 2007-08 season, but then I got to typing and realized I couldn’t think of 10 bad things. So it’s just 5 for now, and the 10 best will be following shortly (pretty sure I can think of 10 there). 5. The play of Mattias Norstrom during the regular season. He made over $4 million, and played like he was worth less than $1 million. I know I ranted about this several times earlier in the season, but he was consistently our worst defenseman through the whole season. 4. March. Well March has always been my least favorite month of the year (too much basketball), but the Stars seemed to hate March at a whole new level this season. I know it was a difficult month thanks to the wonderful scheduling of the NHL and there was going to have to be some dropoff after the amazing February we had. I just didn’t expect the Stars would play that terribly. I admit that I had moments during that month when I wasn’t sure if we deserved to be in the playoffs. Luckily they overcame the darkest month of the season and played well in April AND May. 3. Zubie and Boucher missing most of the season with injuries. It hurt to have them out. Our rookies stepped up to the task and performed well and Robi stepped in great for Zubie on the power play, but we still missed the experience those guys brought to the ice. On a personal level, I know this couldn’t have been a good year for them either. 2. No Cup. We did have a great run though, didn’t we? I love that we got so far in the playoffs when very few expected us to make it out of the first round. Even though we didn’t win it all, these 3 playoff rounds gave our entire team playoff experience they had never had (or hadn’t in a long time). 1. The trade. Now that the season is over, I’ll admit the trade wasn’t as terrible as I initially thought (more thoughts on that later) but it still goes down as my worst moment for the season. Losing Smitty, Jeffy, and Jussi hurt. I know that Richards proved himself in the playoffs, but I still think the Stars would have been better off getting a scoring winger instead of another center. I also still think the Stars gave up too much to get him. With Stu and Lehtinen out, it would have been great to have Jeffy in the lineup for his defensive play and ability in the faceoff circle. If Stu decides to retire, then that leaves us with a bigger hole of finding a defensive forward as good as Stu or Jeffy. According to TSN, Darryl Sydor will finally make an appearance with Pittsburgh tonight in the playoffs. He hasn’t played since March 31 so this will be his first playoff game of the year. Maybe I’m biased about Syd, but WHY IS PITTSBURGH SITTING HIM? I’m not sure how they can justify that any of their defensemen are more talented than him, unless he doesn’t fit into their “style”. If that’s the case, then why did they sign him in the first place? I think one of the Pens biggest problems (besides the fact they have Crosby) is that they don’t have many veteran leaders in the room and on the ice. After Game 2, Crosby and Malkin both said they felt like they only lost the game by “a few bounces” so they felt they didn’t need to make drastic changes to their game. I guess they don’t need to make changes if they want to get swept without scoring a goal. And I mean, they’re more than welcome to do that if that’s what they want. Let me start this by saying that I have wanted to sit with the Fanatics for quite some time now. I remember being at a game last spring and seeing that the Stars were holding auditions for something called the Havoc Fanatics. I was unaware of what all the group entailed, but from Jeff K’s description, it sounded like me. I attend every Stars game I am able to, and I watch or listen to all of the others while I’m at home or school. We request all the tickets in our package to be in the last row because I like to stand… and there’s my foot tall hat to consider. Most people usually don’t like sitting behind that. Anyway, I really wanted to go to the tryouts and try to be a Fanatic, but home is 200 miles north of Dallas and school is 250 miles south of Dallas so it’s hard for me to make it to games, much less tryouts on a Wednesday night. So I didn’t try out for the Fanatics. I attended the last game of the season that year and spent much of the game looking at the Fanatics with my binoculars and wishing I could be up there. This past season, I started to get over not being a Fanatic by screaming and standing and generally doing whatever I felt like in my section. Needless to say, sometimes the people sitting next to me weren’t all that happy. However, my time of not being a Fanatic was about to change. I had tickets to Game 4 of the Detroit series and I KNEW the Stars were going to win (I’ve never seen Detroit win against the Stars when I’ve been there). After standing down with our signs at the pregame skate, Sarah and I headed up to the Fanatics section because I wanted to get some pictures of all of their signs and artwork they had up for the playoffs. We must have walked up at the right time because as soon as we got there one of the Fanatics was herding a Detroit fan out of the section. The Fanatic walked up to us (I don’t even think I ever got her name) and asked if Sarah and I would be willing to trade our tickets with Detroit fan and his friend because they couldn’t sit up in the section. We immediately said yes and showed the two guys to our seats. I did feel a little bad about leaving my parents and sticking a Detroit fan in my place, but I really wanted to sit with the Fanatics. Sarah and I found seats in the middle of the section and got settled with our signs and multitude of other stuff. It was already time for the game to start and we found ourselves engulfed in the American flag. As soon as I realized this, I started to get giddy. I would get to help the American flag “wave” at the end of the anthem! The game passed by in a blur. I’ve never felt so at home at a Stars game before. I got to stand up the whole game and yell and cheer as loud as I wanted without people looking at me like I belonged in a mental institution. One of the Fanatics wearing a Richards jersey recognized us from our blog and even took a picture of us in the section before the 2nd period started. By the end of the game I was exhausted and Sarah was sweating like she had played in the game. I think the Fanatics section is the only warm section in the arena. With all the screaming and jumping around, I can see how it gets toasty up there. Leaving the arena after a victory was a great feeling. Sarah and I stood near the escalator holding our “Believe” sign high above our heads and started several Stars chants with the people leaving. 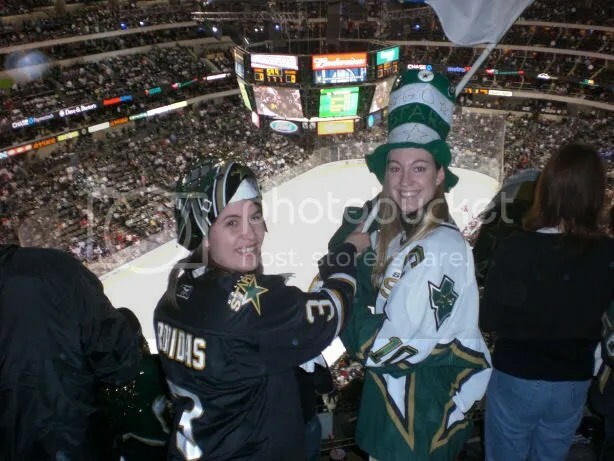 I don’t know if this was my favorite Stars game ever (Game 6 against the Guppies is pretty high up there too), but I definitely had the most fun. I finally felt like I got to be myself up there, and all the other Fanatics were so welcoming to us “babies” in the section. I would love to come cheer with you guys again next season. It was a great run Stars…. too bad it couldn’t go longer. You were amazing this season, and at the end, I am truly proud to call you my team. I won’t lie, there were moments during the regular season when I really wondered if this team would even make the playoffs, much less make it to the Conference Finals. Last year when the Stars lost to Vancouver, I went through all the members of the team and said what I thought about each of them. Right now, I don’t feel like doing this because there are three players that I think deserve all my attention. One of them is without a doubt the MVP of this team off the ice and on the ice in the regular season and the playoffs. The other was an unspoken hero who became pretty well known for the sacrifices he made during the playoffs. The last player is someone I ragged on all season, and I can’t explain how much I regret that right now. Brenden Morrow. Ever since I saw him lay an awesome hit on Jeremy Roenick in 2003, he became my favorite player. His rookie year I told people he would one day be captain of this team. And what a captain he has become. I have never seen anyone skate with more passion in every possible situation, and he skates no matter what is wrong with him. Tippett said in his press conference after the game that besides the bruises on his face, Brenden has a tear in his shoulder and he’s been skating on one leg since the last game of the San Jose series. Brenden said that the only thing that would keep him out of the game was “getting hit by a train on its way home” and he meant it. This truly is his team, and I don’t want anyone else to be wearing that “C” for a very long time. Just don’t ignore my signs anymore, k? Stephane Robidas. You truly are the little hero that could. If someone asked me what a hockey player should be like, you would be one of the first people I would talk about. Your sacrifices to the game have been incredible, and most of these sacrifices have not come when you’ve been the star player of your team. The never give up attitide you have is always motivating. Tippett didn’t have to reveal anything about your injuries because you wore them with pride on your face. I find myself smiling a little when I see the little guy with the cage skate by, but here’s to next season with no cage. Mattias Norstrom. I don’t know the number of times during the regular season that I called you worthless or some other not-so-nice synonym. I take that all back now. You were completely different in the playoffs, and I finally saw how much you wanted to play and how well you wanted to do. You managed to do all of this while battling a sports hernia, which keeps almost all players out of the game. I don’t know if you’ll be with us next season, but it’d be nice to have you back. The Stars need to win. If they come out and play like they did Thursday, then this is going to be a short series. I know they have the ability to play the Wings competetively and make this series interesting. Just as in the first two series, we need to stay out of the box in the first period. Some of those calls in Game 1 were pretty suspicious, but the Stars have to play through that. If the refs are going to call dumb penalties on them, they need to figure out how to get the PK going and play through it. Marty needs to be better. I know he played well on Thursday, and the goals came from screens, odd-man rushes, etc but he needs to be amazing. He’s going to have to take his game to a different level for us to have a chance at winning this series. Stu is still out tonight. I’m really worried about that “concussion” of his. I know that if he felt “moderately alive” (stole that from my dad) then he’d be playing in the series because we need him on the penalty kill and the line with Modano and Ott. Hopefully he will return in Game 3 or 4 in Dallas. With all that being said, I think we still have a real shot at this series. BELIEVE! On a side note, it got up to 100 degrees here today!